We are taking a break for the summer and will not be publishing on August 15. However, we have lots of reading suggestions in this issue if you are lucky enough to be able to take a break as well. Look back at a year of tweets and see which articles made the best impression. Reader’s advisory isn’t just about the story, it’s also about how you tell it. Charmaine Atrooshi leads us into the world of audiobook recommendations. Looking for some summer reading? Take a peek at the Open Shelf editing team’s reading lists and see if anything interests you. 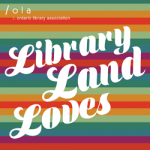 Read our latest Trendz column and keep up to date with the world of libraries. Have a great summer, and we’ll see you in September.